Ever since I discovered how to make dessert/jewelry stands (as seen in this post) on a dime, I’ve been a little obsessed with them. 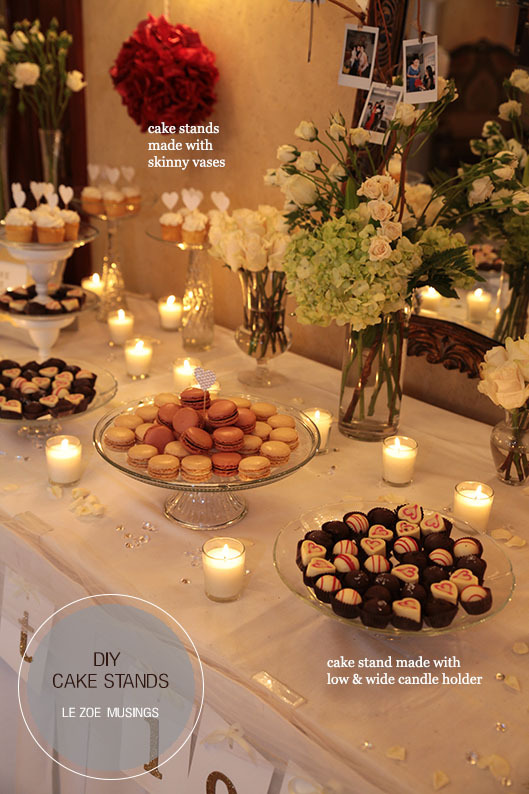 Then comes my sister’s wedding… It was just the perfect opportunity for me utilize my DIY cake stand-making skillzzz. This 2 tier dessert stand was among the many types of stands that I made for the dessert table. You wouldn’t believe how easy and cheap it was! First things first…find a base. 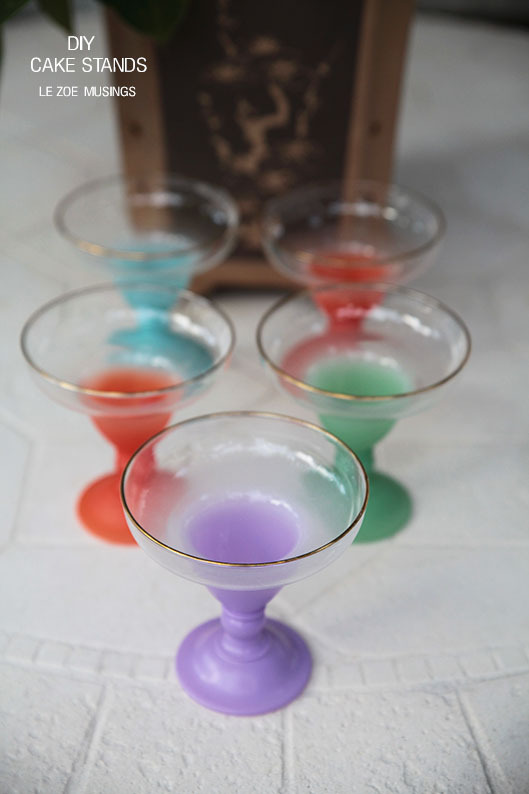 I found these multi-colored glasses at the thrift store for $1/each. I like them because of their wide rims. I knew those colors were not going to fly for my dessert table so I spray painted them a glossy white. Once dried, super glue a clear glass plate onto the rim. Stack hardcover books on top of the plate and let dry overnight. 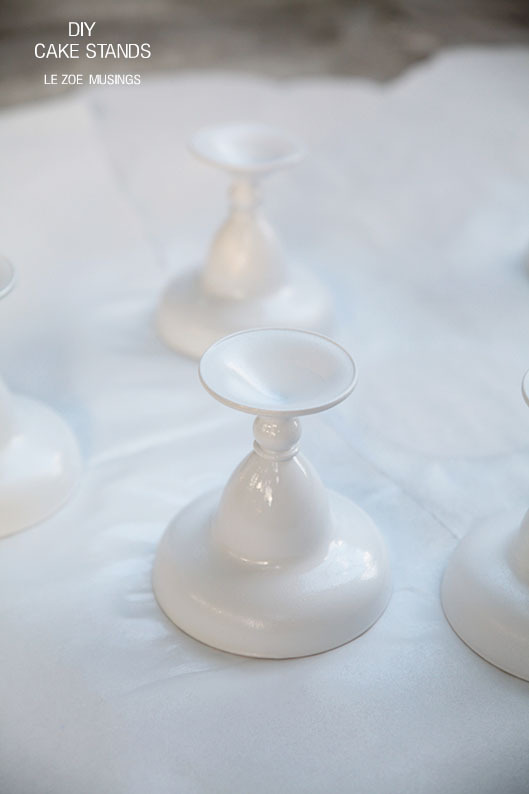 I also made cake/dessert stands with other bases such as skinny glass vases as seen in the far back left and with low but wide candle holders as seen on the front row. The possibilities are endless and so cheap. On average, my cake stands cost me around $2/each (all items thrifted). And to make it 2 tier, just stack them up! 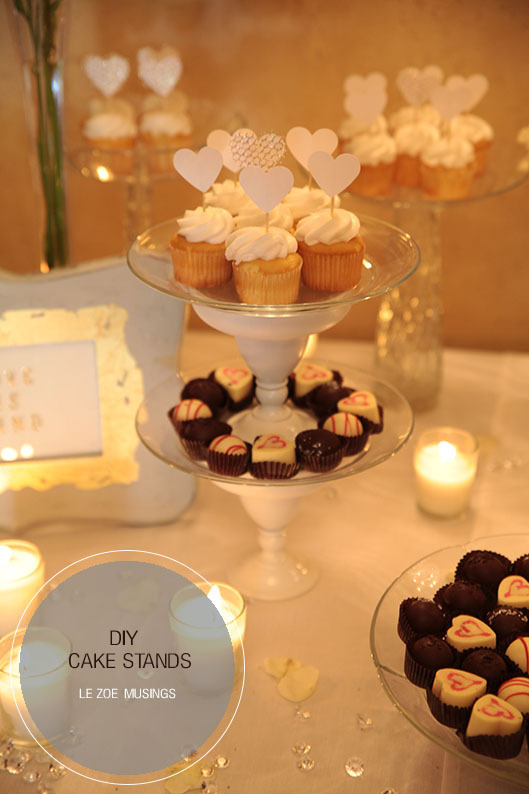 Cupcake heart toppers were also DIY- 1. punch out heart shapes 2. glue them onto toothpicks. Easy as pie. Excellent idea – your cake stands look fabulous! Thanks for sharing how you did it and for great photos. This is an absolutely fabolous idea! Wow, so clever! There’s a new one! I love these too – I’ve been making them using pretty teacups as the pillars, but you have inspired me to try it with glass. I also love your idea of painting the glasses first. Such a great and cheap idea! Such a cute idea, they turned out great! Love it! I have been wanting to buy 2-tier cake stand but I don’t need to anymore! 🙂 Thanks! I love this idea, thanks for sharing they are so simple and elegant! Simply gorgeous! 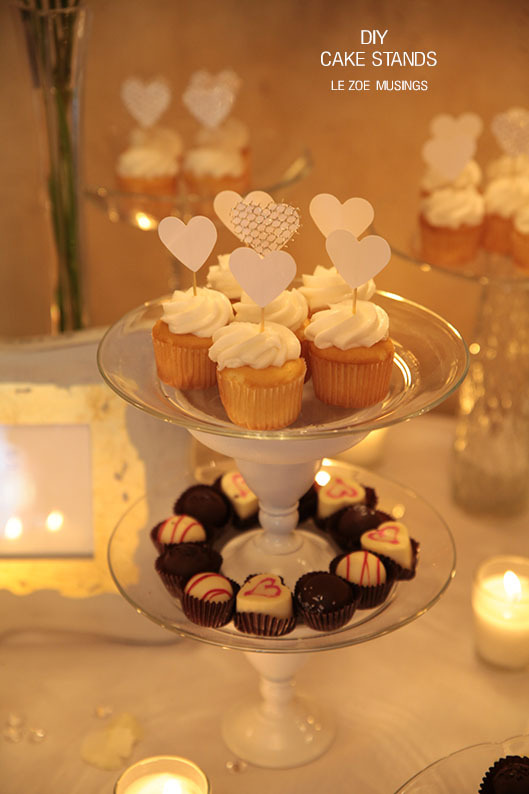 Love your handmade cake stands and the cupcake toppers! Kudos on the photos as well! The candlelight makes this so romantic and beautiful! great idea! I will do that!!! The dessert table looks gorgeous, Kellie! Gorgeous!! 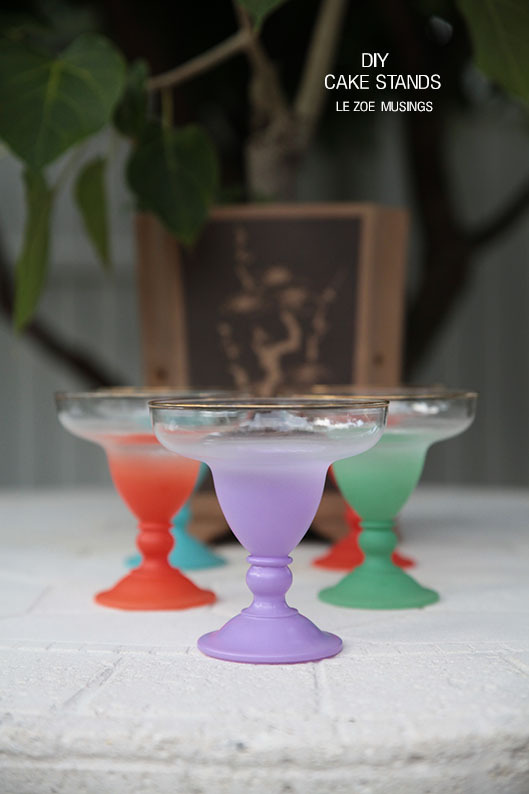 I love this idea, another thing to be on the look out for at second hand stored – margarita glasses!